Finding luxurious apartment homes in Seattle, Washington has never been easier. Experience fine apartment living at Jem Wey and Aloha Wey. Our community is conveniently close to major highways, local shopping, fine dining and entertainment. Here, you will find beautifully manicured landscaping, impressive floor plans and a commitment to excellence that is above the rest. Jem Wey has three impressive selections of spacious floor plans to choose from. Aloha Wey has four spaciously designed floor plans. Each of our spacious apartment homes come well-appointed with highly attractive features such as a balcony or patio, some paid utilities, an all electric kitchen, dishwasher, carpeted flooring, nine ft. ceilings, spectacular views, a refrigerator, mini/vertical blinds, cable ready and more! The Aloha Wey apartments feature disability access, a breakfast bar, pantry, gas fireplace, washer/dryer in unit, and a garage. 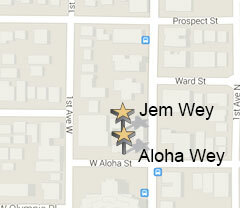 Discover a life of luxury and endless comforts here at Jem Wey and Aloha Wey. For those warm days, residents can walk down to the nearby park and have a picnic with friends and family. Active enthusiasts can enjoy the jogging and hiking trails through out Russell Park. Experience on-site and on-call maintenance and covered parking in a well-kept peaceful apartment community. Visit our photo gallery and see for yourself why Jem Wey and Aloha Wey is the perfect place to call home!